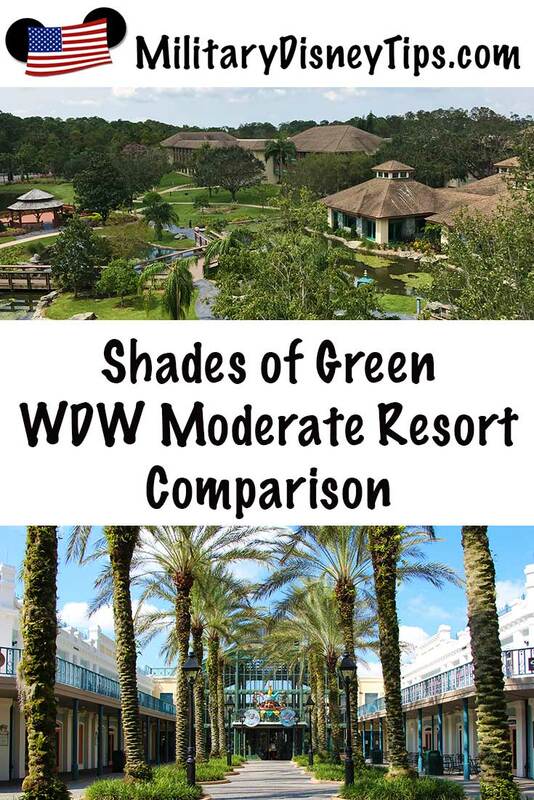 Welcome to the second installment of the Shades of Green – Disney Resort Comparison Series. This is the second post on the differences between Shades of Green and the Disney World resorts, this series is offered in the hope it will help you with your Disney trip planning. 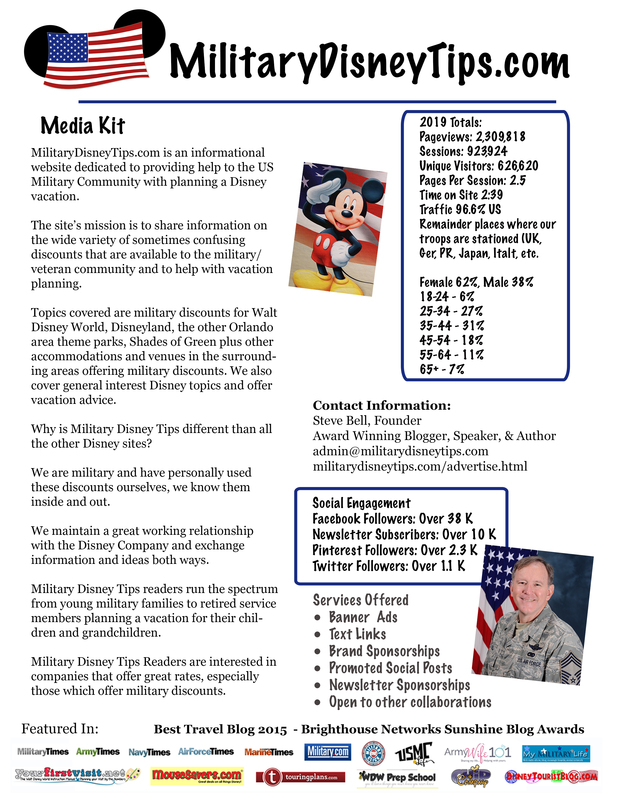 Military members who use Disney’s Armed Forces Salute room discounts receive up to 30% discount off of regular Walt Disney World Moderate Resort rates. I hope that you find this post helpful! Be sure to post comments and questions below. Include amenities such as: full-service restaurants, food courts, limited room service, luggage service, swimming pools with a slide and hot tub, on-site recreation, and bus or boat transportation. For this comparison I’ll be using the Port Orleans Riverside Resort, but all of the Disney Moderates are very similar, varying only in the exterior and interior themes and food options in table service restaurants. Some do have special themed rooms, which cost extra, such as Princess or Pirate Rooms. This is a comparison between the lowest cost room at each resort, a standard view at Riverside and a Standard Room at Shades. The Riverside’s room in this review is representative of all the other Disney Moderate resorts. Disney’s Moderates offer upgraded rooms for from $10 to $80 per night (not including suites or concierge). These upgrades can be in room view or interior decoration. Views range from the basic covered here through (roughly in order) garden view, pool view, water view, to preferred rooms (location) and combos thereof. Shades of Green’s rooms come in Standard (rated here), Poolside (identical to the standard room except for the view) for $10 more per night, and Family Suites. For this comparison I’ll be using Disney’s summer rates (a typical travel time for families with kids) with the 35% Disney Armed Forces Salute discount. Disney prices will be the cheapest most weeks on Monday to Wednesday nights. Sunday & Thursday are in between in price, while Friday & Saturday nights are the most expensive. Note, starting in 2018 the Disney Armed Forces Salute room discount rates are not a set 35%. They are “up to” 35%, meaning that depending on your dates you might receive a lower discount amount; the only way to know what your price will be is to call (or have your Travel Agent do it for you). Shades of Green – Shades of Green has 3 price categories for the standard room based upon your rank/status. Port Orleans Riverside – As mentioned above this comparison uses the summer price period (there are 15 other WDW price periods per year). Summer room rates are more level, in this case $272 Sunday to Thursday and $273 Friday & Saturday. When the maximum Disney Armed Forces Salute discount of 35% the rate is applied and 11.5% in taxes are applied the summer rates are reduced to $197.13 Sunday to Thursday/$197.85 Friday & Saturday nights. For each additional adult over 2 there is a $15 per night charge. There are times of the year when Disney’s Moderate resorts are very close in price to Shades of Green Category 3 rates, only 9 dollars a night more! The Moderate rooms have a maximum of four-person occupancy per room (plus one child under 3 in a crib), some Riverside room do have a fold down bed for a 5th person. While Shades’ offers five-person occupancy per room (plus one child under 3 in a crib). Port Orleans Riverside – The Riverside room measured in at 314 square feet with a bedroom, small separate vanity area, which contained the clothes hanging area and shelf. All Riverside rooms have outside room entrances from a common sidewalk and no exterior furniture. Both resorts sleep 5 and had comfortable beds and pillows as well as great bedding. Port Orleans Riverside – 2 Queen sized beds and in this particular room a fold down single for one. Each had complimentary wifi (Shades’ is not very strong in the guest rooms), flat screen TV’s, mini fridge, safe (Shades’ was good sized, the Riverside’s was quite small), iron and ironing board, toiletries, luggage rack, and at Shades a hair dryer (available on request from Riverside). The biggest difference between staying at Shades and a Disney resort is themeing. Shades is decorated like any civilian hotel and could be placed anywhere, worldwide and fit in. Shades of Green – Many worry that staying at Shades of Green will be like staying in billeting on base, but it definitely is not, the rooms are top notch. The rooms are decorated in greens (to tie into the resort name) with pictures of scenery and plants. The furniture is all good quality. It should be noted that, before the Army MWR purchased the resort from WDW, it was a deluxe Disney resort. 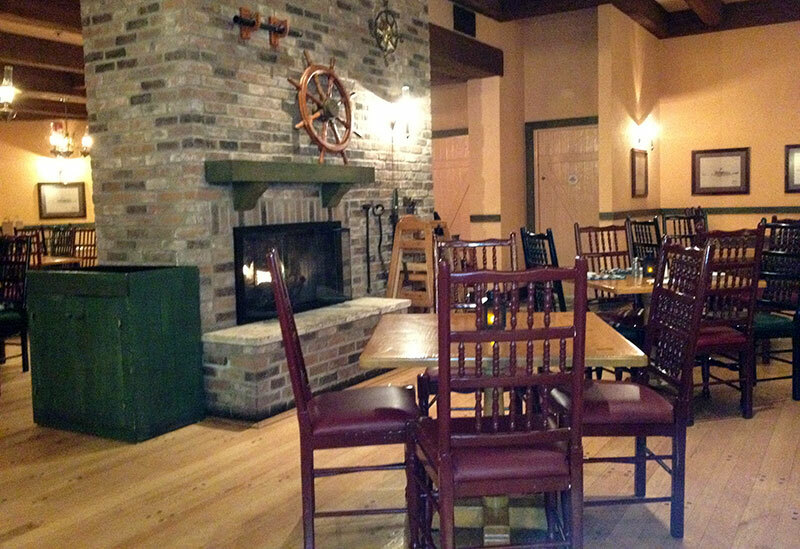 Port Orleans Riverside – The room in this review is located in the Aligator Bayou themed section and decorated in simulated roughhewn wood furniture and rustic lighting. The furniture was all good quality too. Other buildings within this resort and the other Moderates are themed differently. Shades of Green – has a variety of restaurants, Manginos Steakhouse (Steaks and Seafood), The Garden Gallery (breakfast and dinner buffets and a la carte), Evergreens Sports Bar & Grill (sandwiches, wraps and burgers, salads, pizza, wings, and nachos), the Express Cafe (counter service breakfast and lunch sandwiches, pastries, snacks), the Java Cafe (Starbucks coffees teas, pastries and ice cream, and On the Greens Grill (grilled hot dogs, Italian sausage, hamburgers, sandwiches). The counter service locations are just fine. At the Garden Gallery much of the buffet food comes off the Sysco truck pre made and is served as is. The food quality and service at Manginos is sub-par to what you’ll find at a Disney table service restaurant. And the food at Evergreens is microwaved and only recommended if there is no other option. You’ll find no food court here as you will at a Disney Moderate! There isn’t the volume of people to make that necessary. 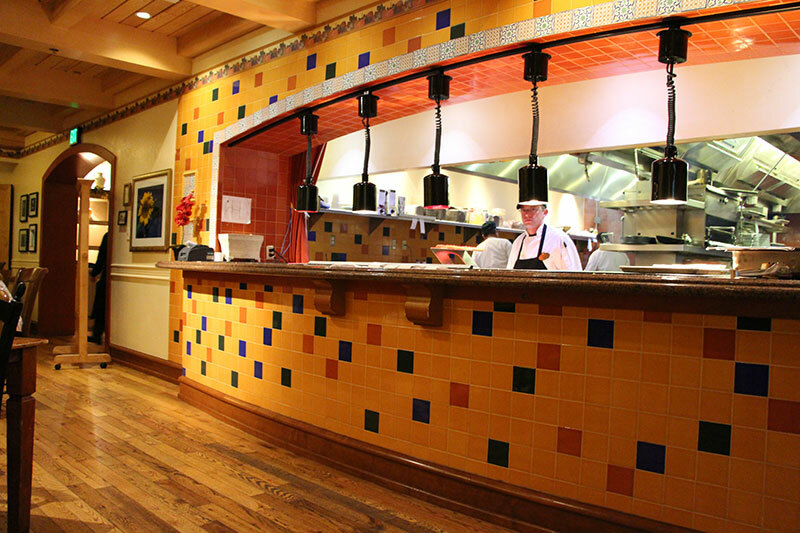 Port Orleans Riverside – There are two dining option at Riverside, Boatwright’s Dining Hall (Table Service) and the Riverside Mill Food Court (Counter Service). Boatwright’s is the full service restaurant at Riverside. Their menu features basic fare with a Cajun flare. Specialties are Andouille-crusted catfish; jambalaya with chicken and Andouille sausage. Disney Resort food courts are set up with several stations at which you can a get a wide variety of menu items. In the morning they offer standard breakfast fare and then switch over to their rest of the day menus. The food courts can be loud and hectic in the mornings, when everyone is trying to get going to the theme parks at the same time. Get there by 7am for a less hectic experience. Open 6am-midnight, grab a pizza to take back to the room after you return from the parks. The River Roost Lounge offers a full bar and snacks, there is also a pool bar to enjoy while relaxing by the pool. Limited room service is also available. The recreation options vary quite a bit between the two resorts. Shades of Green – Shades of Green has two pools, the Mill Pond pool shaped like the Mickey Mouse icon and has a water slide and kids water play area as well as the Magnolia Pool, which features zero entry walk in access. Shades has an arcade and free console games and computers furnished by Raytheon. There are two lighted tennis courts and the resorts sits in the middle of two of Disney’s golf courses. The clubhouse shares a parking lot with Shades of Green. For the little ones there is a jungle gym/play set. Port Orleans Riverside – Disney Moderates offer a full range of recreation options. Your recreation options at Riverside include, multiple pools and hot tubs, horse drawn carriage rides, bike and surrey bike rentals, boat rentals (motor, pedal, and kayak), fishing, outdoor movies, a playground, and a video arcade. Port Orleans Riverside – Guests arriving at Orlando International Airport via airline have access to the Disney’s Magical Express, a free bus service from the airport to your Disney resort. Those driving to their vacation at the Disney Port Orleans Riverside will pay $19 per night to park. Those staying at Disney Resorts have access to WDW’s fleet of buses, water taxies, monorails and other transportation, depending on location. Shades of Green – Shades features on-site Disney and Orlando ticket sales (tax free), an AAFES Store (tax free souvenirs and sundries), a Shades gift Shop, Alamo Car Rental, luggage service, airline check-in, two guest laundries, scooter rentals, an on-site Gym with cardio and Nautilus equipment, and a full service Spa. Port Orleans Riverside – Has a Disney resort gift shop (souvenirs and sundries), luggage service, airline check-in, and a guest laundry. Port Orleans Riverside – 60-Day Fast Pass Plus reservations, complimentary Magic Bands, Extra Magic Hours (early or late entry into specific parks on specific days), resort package delivery, Disney’s Magical Express, Disney Transportation, use of the Disney Dining Plan, charging to your room from all Disney locations. Those Shades guests wanting to use Magic Bands for their park tickets and FastPass Plus return times will need to buy their own bands, either ahead of time at the Disney Store or at a WDW gift shop. Good comparison with many of the values & amenities well pointed out – though I feel you missed the service aspect of the comparison. We’ve stayed there a few times and each time I bid myself to have an open mind & be thankful to be at WDW. However, the service at Shades does not compare to the Disney Resorts. Each time we have stayed at Shades we have had poor service; at the front desk (waiting for anything), at the tickets & tours (if there are even there – many times you are standing around waiting & waiting), at the dining (never had good service) and even from the guests staying at Shades of Green. My husband & I went for a drink at Evergreens bar at 1030 at night & there were little kids in there crying & fussing, while other kids were running in & out of the pool into Evergreens). Even the menu at Evergreens says to “place your food & drink orders at the bar” so no service there. After 4 visits to Shades we have decided that we won’t return -there’s just no Disney “Magic”. I will pass your comparison on to others as it is well done! Thanks for the comment! Good point on the service, you are correct, I’ve experienced it too. I have to say though my experience with other guests at SoG has been hugely positive. I find very friendly folks who greet each other rather than passing in silence as happens in general public resorts. I think no matter where you go today you’ll occasionally run into people who don’t pay the slightest bit of attention to what their kids are doing and haven’t taught them manners and restraint. Thanks for the article. I have a reservation at SOG and POFQ for Oct. which means I’m hoping for the new discounts to come out. You hit the nail on the head when you said transportation is the main difference. and the reason I’m leaning that way. Also magic bands are another concern. Thanks for all you do to keep us informed of changes and discounts. Keep up the great work. It’s my pleasure Denise, I love doing it! The main reason I may choose to stay at a Disney owned property rather than SOG is simply that to my knowledge guests of the SOG do not have access to the Disney meal plan which leaves you paying a la carte for each meal and snack. I have to do some math but was hoping this article would have addressed that. I have stayed at SOG before (2008) and thought it was great to use the transportation at the nearby Polynesian. You might want to review menus at restaurants you plan at dining at to make sure the dining plan is a good deal for you. I’ve found that unless you’re loading up on character meals or eating the most expensive item on the menu, you’re losing money with the dining plan. I canceled ours this year after looking at all the menus and adding up what we’d most likely be ordering. I found that paying out of pocket was going to save me $300! And that’s just for one adult and one child under 10. When she turns 10 next year and has to be on the adult dining plan, I’d save even more with paying out of pocket. I have another comparison you might consider: walking to/from your room. At SoG, your walk to/from the lobby is indoors (nice when the weather is too hot or too wet) and at Values/Moderates you have to walk outdoors to get to your building. But the SoG hallways have many turns and I have gotten lost more than once since there are no signs to point you toward your room and the walk is often not intuitive (ever stayed on the first floor near the Mill Pool??? It is so confusing to get there from the lobby!). It seems that although you might have a longer walk to get to your room at a Moderate, the route to take is more obvious. We stayed at SoG a four years ago at Christmas time, then 2 years later we stayed at Pop Century. We are returning to SoG because we found the service wonderful, we had no wait times for the bus, and our fellow travelers were better behaved than at Pop. I left my cell phone charger at home so I called the front desk at SoG to see if they had any extras lying around, perhaps in the lost and found, that I could borrow for the remainder of our trip. The wonderful staff was able to locate a charger for me within 5 minutes, which considering that I noticed my charger had not been packed at 23:00 was no small feat. As I stated we were there at Christmas, one of the busiest times to be at Disney, yet we never saw any unmonitored children running around the hotel the way we did at Pop 2 years later. At Pop we often waited 45 min or more in line for transportation, at SOG if the dedicated bus service was scheduled for another 15 – 20 min the staff was always quick to let us know and offer to drive us to the end of the property on the Shady Shuttle. One of the Shady Shuttle drivers was a great tour guide that gave us tons of good to know advice for Disney first timers. We ended up taking the shuttle more often then not just to talk to him. Besides, with the portions that Disney serves walking to and from the Polynesian was probably a good idea! At Pop my husband complained that the rooms were so small we felt claustrophobic, but at SoG we had plenty of room to spread out. I even had enough room to get in some yoga in the morning before we headed to the park. At Pop I barely had enough room to stretch out my arms, trying to get into any other pose was out of the question. As the families early riser the separate vanity area with a door I could close was also a big deal. At Pop I was always afraid that I would wake everyone else up just applying my makeup. My only reservations about SoG is that the transportation we reserved to pick us up at the airport last time was 2 hours late, which was not SoG’s fault, and Pop has the wonderful Magic Shuttle, and the new Magic Band system with the Fast Pass +. It seems as though anyone not staying on Disney Property is getting screwed with their new system, but since we are going at the end of Sept, a time which usually has lower attendance, we are hoping it will work itself out. Thanks for the great observations and trip report Chris! It’s not so much age as height Lori. It is a single fold out bed. I’m not sure if it is a standard single length though. 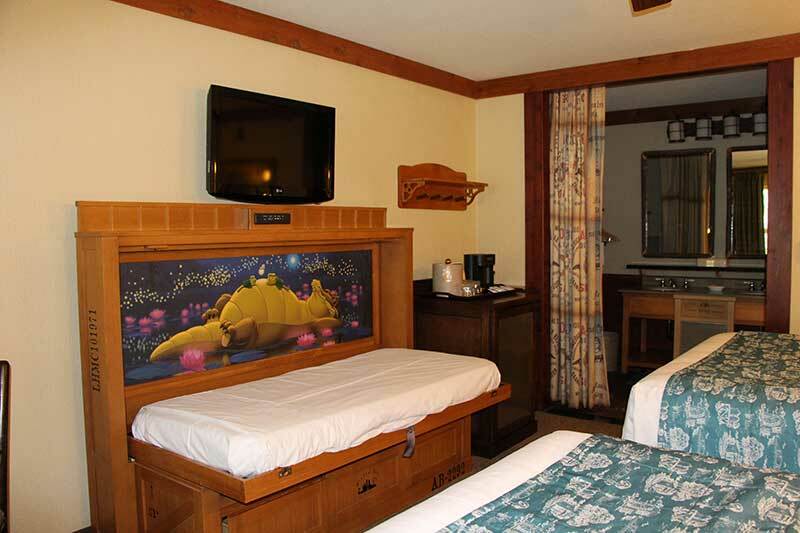 This article was written a couple of years ago but I believe nearly all of Disney’s moderate rooms have now been refurbished and have queen beds. Yes you are correct Caroline. Thanks, I’ve fixed that. Any insight as to dining reservation differences? We want to make reservations at BOG, if we book with SOG instead of a Disney Resort will we still be given the 180 days out for dining booking? Or is the 180 days out only given to those purchasing a dining plan? Thanks! Yes anyone can book 180 days prior to the day in question no matter where they stay (or not i.e. day guests/local area people). The issue is that those staying at Disney resorts can book 180 days prior to check in, for their entire trip up to the first 10 days of the trip. So the day you call for your BOG, those checking from 1 to up to 10 days prior to that date (depending on the length of their stay), have all had a crack at booking for the same day. Thanks for this article. I booked our reservation for Port Orleans Riverside for next year as soon as the 2018 discount came out on Friday. However, after wondering why the reservation was much more expensive than expected, I discovered that we didn’t get the usual 35% moderate resort discount. It was only 30%. So now I’m looking at doing something different for a change to lower the cost. I may try Universal since they offer a good military discount, but also wanted to look at Shades of Green. While I’ve stayed at its sister hotel the Hale Koa on Oahu, I’ve never desired to stay at SOG simply because of the lack of theming and airport transportation. But now I will. We can get a pool-view room, tickets to Universal Orlando, Sea World & Mickey’s Very Merry Christmas party, plus transportation to and from the airport, and to and from Universal & Sea World all for $100 less than the room-only cost of my reservation at Riverside with the 30% discount. And it could go down even more with the sporadic specials SOG offers if they decide later next year to add one around the time we’d like to go. Shades can be a big part of a money saving vacation! It’ll just be slightly different than you are used to but great nonetheless. SoG allows a sponsor to book up to three rooms. Can a sponsor get the discount on more than room at a WDW resort?